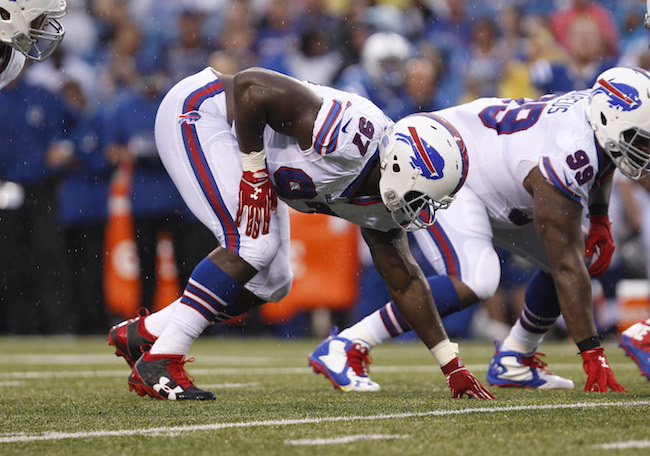 The New York Giants have signed unrestricted free agent defensive tackle Corbin Bryant (Buffalo Bills). Newsday is reporting that the contract is a 1-year deal. To make room for Bryant, the Giants waived center Khaled Holmes. The 29-year old Bryant was originally signed by the Chicago Bears as an undrafted rookie free agent after the 2011 NFL Draft. He has spent time with the Bears (2011), Pittsburgh Steelers (2011-2012), and Buffalo Bills (2012-2016). Bryant has played in 56 regular-season games with 18 starts, including six games in 2016 before he was placed on Injured Reserve with a shoulder injury in October. Bryant has decent size (6’4”, 300lbs). Although he only has 2.5 career sacks, Bryant has flashed as disruptive player both against the run and the pass. He needs to stay healthy. Holmes was signed by the Giants to a reserve/future contract in January 2017. Holmes was originally drafted in the 4th round of the 2013 NFL Draft by the Indianapolis Colts. In three seasons with the Colts, Holmes played in 17 regular-season games with nine starts. The Colts waived him in May 2016. He then spent a couple of weeks with the Chicago Bears before being waived in the final cuts. The New York Giants held their next-to-last Organized Team Activity (OTA) practice on Thursday. The practice was not open to the media or public. Teams may conduct a total of 10 days of OTA practices. No live contact is permitted, but 7-on-7, 9-on-7 and 11-on-11 drills are permitted. The team’s last OTA will be held on Friday, which will be open to the media. A mandatory mini-camp will be held on June 13-15. The video of a Giants Insider Q&A with quarterback Geno Smith is available at Giants.com.